After about 5 months from the first meetup in Amsterdam, we organized the second meetup. The venue changed from het Volkskrant gebouw to Mediamatic which also sponsored us the venue! I have to add that Mediamatic is a awesome location for QS Meetups. They had an exhibition about early computers and consoles which perfectly fits to the QS mood. Ten minutes before the start, people started to arrive and just before we started we could count more then eighty people! 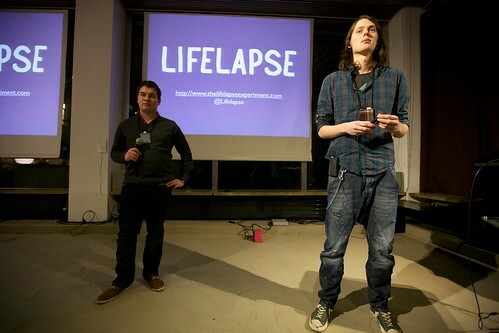 After a short introduction by Maarten den Braber; Glenn Wolters and Jeroen Bos from Lifelapse took the stage. They started with a short movie about their project which was created as an invention during their semesters at school. They’ve build an iPhone app which let’s you take a picture every 30 seconds and publish it as a movie. I’ve beta tested their app and find it awesome for capturing events like these meetups! 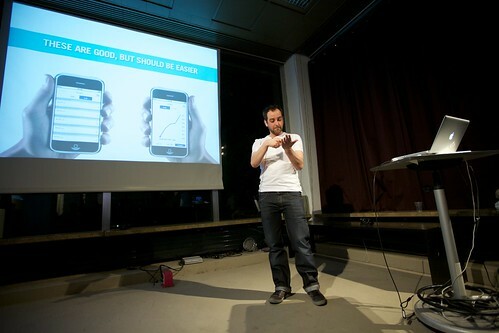 Second to take the stage was Tim van den Dool who talked about his ongoing project Livind(Asssisted Daily Living). The system monitors elderly people in a non-invasive way to watch for accidents or other irregular things. If something happens, parents or caretakers are remotely notified trough SMS or a beeper. He also talked about the growth of the project and how much expectations tend to be different from reality. Just before the break Denis Harscoat, founder of Quantter and co-organizer of QS London talked about his start-up and showed how it works by letting people quantt trough Twitter. An interesting discussion started about public/private tracking and there was lots of good feedback! After a 10 minute break we are being shown the fun side of the Quantified Self when Leonieke and Willempje talk about figurerunning. With apps like Runkeeper they try to draw figures on maps, both succesfull drawings as well as hilarious failures are being shown and there is lots of laughing in the audience! Try it out yourself, and realize it is not as easy as it sounds, if you succeed you may even end up in the half of fame! James Burke gave a short talk about his ongoing project about memories and coins the sentence: Life as a software CVS. He ponders about a system that could be used as a memory and provides food for thought in a more philosophical way. The last speaker Ben Blench talked about tracking his infant and more specifically the tools he used. He made in interesting comparison between digital and analog and noticed that most digital things have too much functions and lack flexibility. Meanwhile, paper supports fuzziness of data but has less methods of quantification. His talk in combination with some funny pictures completes the session and we take the discussion to the bar! 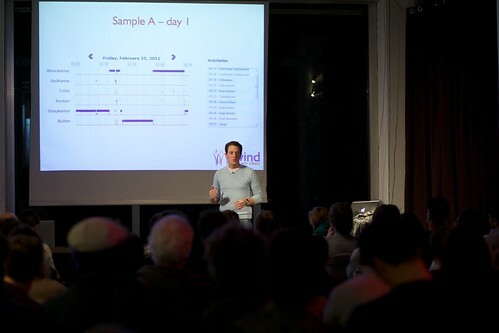 The second Quantified Self meetup in Amsterdam was awesome! We hope to organize another meetup just before the QS Conference! Again thanks to Sebastiaan ter Burg, who happily provided us with photos. And the videos will be online this weekend! We hope to see you next time!